You would never guess that this beautiful natural location is in the middle of the city! The Kasugai Japanese Garden is located in the downtown core of Kelowna, BC. We love the peaceful tranquility of the lovely trees, the bubbling creek, and the pond (filled with Koi!). One of the techniques that we frequently use while documenting an event (weddings, engagement, sessions, & lifestyle sessions) is to take a step back and capturing the environment that the events are taking place in. We feel strongly that these images really tie the story together and provide an overall framework. 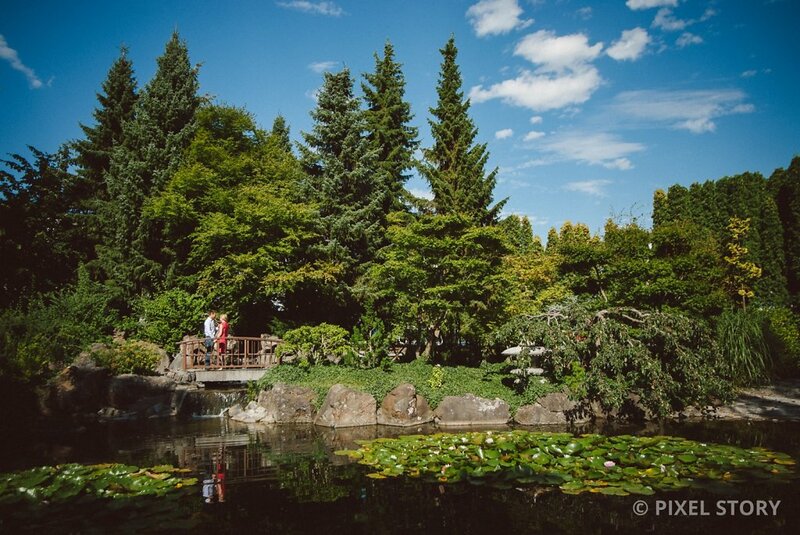 This couple wanted a mix of natural and urban backgrounds which made this location the perfect starting point as it allowed us to continue on to the Kelowna Library and then to Art Walk.